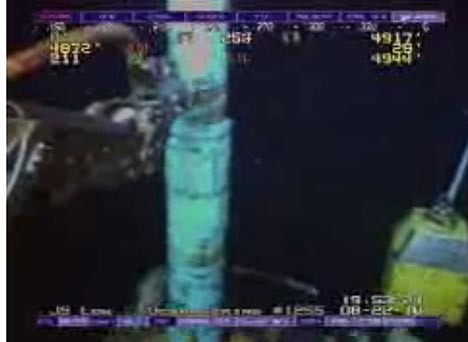 The fishing expedition to recover the drill pipe (DP) from the Blowout Preventer (BOP) at the top of the Deepwater well is moving somewhat slower than initially was suggested would occur. BP have provided a feed from the camera that was lowered into the stack. 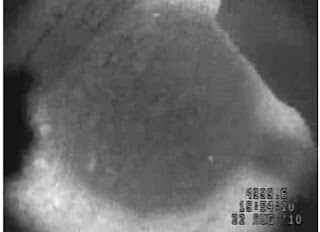 It is not clear, since I wasn’t following this all day, what has been going on, though it has been suggested (H/t Unconformity) that the obstruction that appears in the video was one of the rams in the stack that was in the wrong position. This was followed by an adjustment of the stack, but apparently the camera has been returned to the surface. It may have malfunctioned, since the screen went blank just after this shot. UPDATE: Thanks to Acornus and MoonofA in comments at TOD, the object in front of the camera is apparently one of the two shear blades from the Ram in the stack which has failed to open. MoonofA has posted a better shot of the situation at about 6 am CDT. I have dotted in the rim of the hole further down, so that you can see that the extent that the rams still protrude, though they are higher up so the protrusion is greater. In the meanwhile it appears that it is being fed into the stack without a riser in place, though we could be getting the various BOP/stacks mixed up, since once the BP is out of the way, the intent is to move the DP11 BOP over the well, to replace the old one. 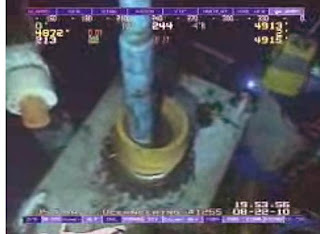 The pipe is now (11:40 pm) back out of the stack. 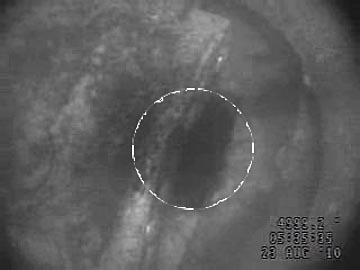 For those who have just heard about the 33 trapped Chilean miners, apparently they were working in the 2,250 ft level of the mine when, seventeen days ago, there was a massive roof collapse in the area that included the access shaft. After two weeks of exploratory drilling, a drill broke through in the area of the refuge where all the miners have been trapped. 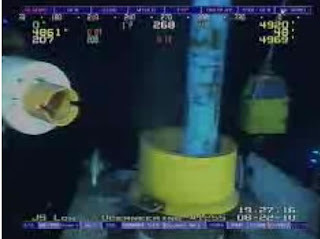 They are all still alive, one sent out a message to his wife attached to the drill, but it is impossible to reach them through the existing workings. As a result a special rescue shaft will be drilled down, large enough to lower a cage into which, one at a time they can be extracted. (The technique was used to rescue the miners at Quecreek mine in the USA). The shaft will be 27-inches in diameter, but it is going to take up to four months to reach that level, and so the current shaft will be used to send down water, food and oxygen to sustain them until then. They have been able to run some equipment and generate electricity and have apparently some considerable room at the refuge site. It apparently takes a couple of days at a time to drill one of the smaller access holes. Our prayers will remain with them and their families.